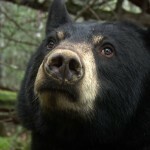 I’ve been obsessed with watching Lily the black bear. Bear researchers from the North American Bear Center (NABC) in Ely, Minnesota have been following and researching Lily since her birth. She is a wild bear who has become accustomed to the researchers, and allows them to get close. She wears a radio collar, so they can locate her and check up on her. She turned three years old last week, and that is the typical age female bears have their first litter of cubs. Lily really cooperated this year by choosing to hibernate in a den close to a power and internet location. The researchers set up a web camera at the mouth of her den, and began broadcasting Lily’s activity (and inactivity) 24/7. 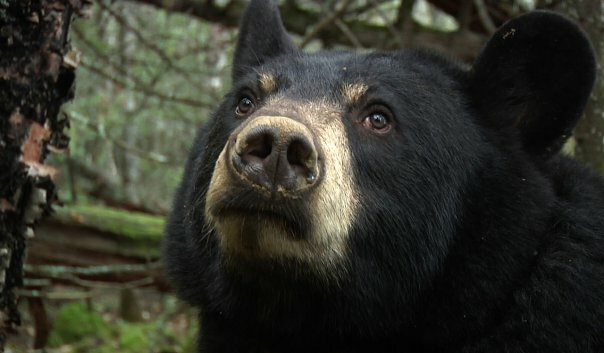 Some things I didn’t know… bears do not sleep all the time during hibernation. They sleep about 22 hours a day, but spend periods off and on in lazy activity, grooming and attending to their den. They don’t eat, drink, urinate or defecate in the den, but might leave the den for a few minutes from time to time to defecate. And female bears have their cubs during hibernation. I found Lily through an online news article and made my way to her Facebook page, and from there I linked to the webcam broadcast. The first time I checked on her, she was sleeping, but the next time, she was more active. That’s all it took for me to become hooked. Watching her dig and nest in her den, wash herself, climb outside each day, and be perfectly oblivious to “Charlotte, the spider” constantly running across her back and the world watching through a web camera, was quite intriguing. And the expectation that she would probably have cubs really added to the excitement. After watching for about a week, last Friday morning it became very apparent that Lily was in advanced labor. I logged on as soon as I got to work and had the webcast going while I did layout. At about 10:30, her activity increased, she rolled over, grunted, tucked her head under her belly, and then suddenly a cub’s squeal was heard. I felt so invested in this that I actually teared up hearing it. 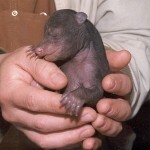 What an incredible experience, to watch a wild bear give birth in a den in the woods of Minnesota! Live! On the internet! Almost 50,000 viewers were watching that morning, and we all waited expectantly for more cubs to come. But alas, it was a litter of one. That’s not unusual at all for a first litter. (See how much I have learned about bears?) The researchers are interested in seeing how the relationship between a mother and a single cub develops. All of the bear families they have followed have been multiple cubs. Lily’s Facebook page has become quite an internet community. When I joined, there were about 4,000 fans. She has over 70,000 fans now, and it grows every day. Unfortunately, people use the Status Wall as a chat room, so it fills up faster than you can read it. Luckily, you can filter the feeds to see just Lily’s updates. The researchers have posted some incredibly interesting updates, and the information and videos on the NABC website are also excellent. Their goal is to educate people about these animals that need not be feared as folks have always thought. If you haven’t seen the video of Lily giving birth, I recommend you watch it on YouTube. And gather the kids to watch it, too. They’ll love it. And then head over to the live webcam and check in on how Lily and her cub are doing right now. Right this very moment.